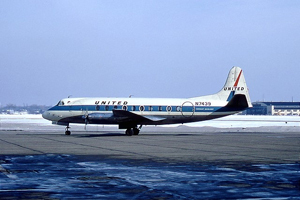 United Airlines Flight 297, a Vickers-Armstrongs Model Viscount 745D airplane, was en route between Newark, NJ and Washington, D.C., at an assigned altitude of 6,000 feet when it struck at least two whistling swans, one on the left horizontal stabilizer and one on the right. The bird impacting the right horizontal stabilizer caused superficial damage whereas the bird strike on the left horizontal stabilizer penetrated into the most forward point of the leading edge. This caused the left horizontal stabilizer to fail and rendered the airplane uncontrollable. All thirteen passengers and all four crewmembers were fatally injured. The Civil Aeronautics Board determined that the probable cause of this accident was a loss of control following separation of the left horizontal stabilizer which had been weakened by a collision with a whistling swan.